A Rohingya boy chopping wood from a tree stump he freed from soil near Kutupalong-Balukhali refugee camp in Bangladesh. 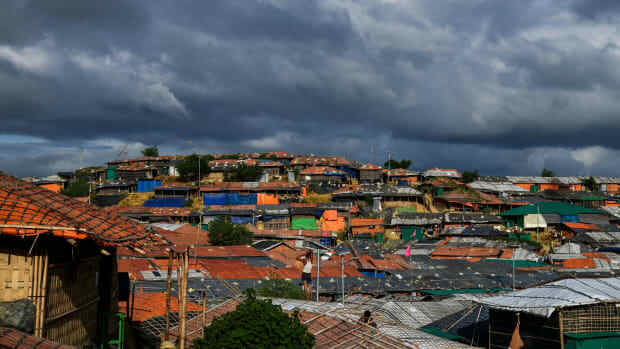 Look out from the high-ground in the middle of Kutupalong and two sights fill the eyes: Myanmar&apos;s green hills silhouetted in the east and dehydrated, denuded mounds pocked by the blue-black tarpaulin sheets of makeshift shelters everywhere else. 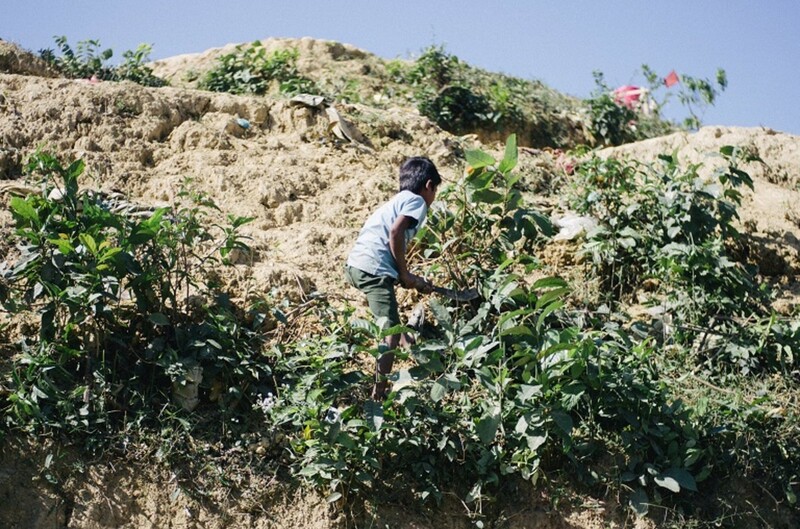 That jarring contrast in Bangladesh&apos;s landscape is new. It&apos;s an indirect consequence of brutal military operations in Myanmar that forced 650,000 Rohingya refugees into the country, the majority since August of 2017. Most of their journeys have involved witnessing horrendous atrocities, flight from burning villages, and then stumbling through forests or battling monsoon-charged waters in search of safety. Along the way they pitched camp wherever they found space and turned to the local forest for everything from shelter to fuel. Satellite images show a clear difference in forest cover between October of 2016 and November of 2017 that looks similar to the aftermath of clear cutting. 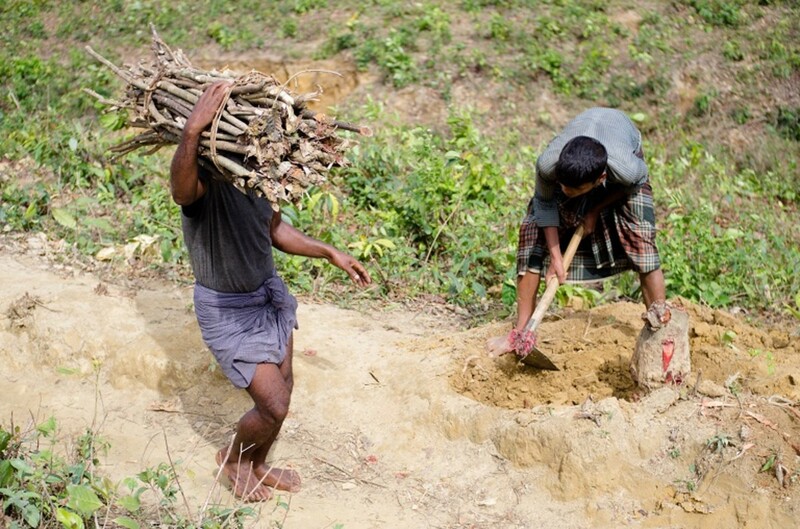 They continue to rely on the forest in Bangladesh. 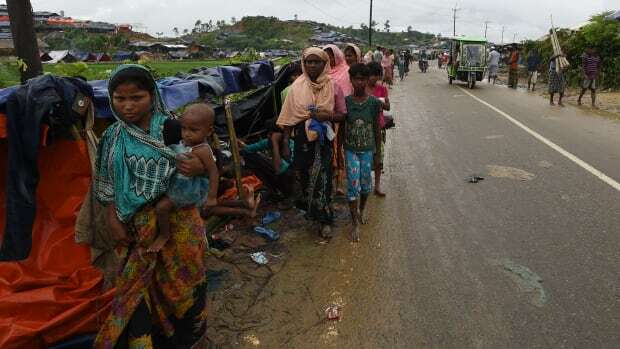 As the refugees poured in through various points along the border, the Bangladeshi military tried to round them up around the existing Kutupalong and Balukhali settlements—in such numbers that they merged into the world&apos;s largest refugee camp. The weight and rate of that influx has created an additional environmental crisis in Bangladesh&apos;s sensitive border district, stripping away 4,000 acres of forest land, according to numbers from an internal Bangladesh forestry department report shared with Mongabay. Crucial groundwater supplies have also been depleted and contaminated, according to the World Health Organization. 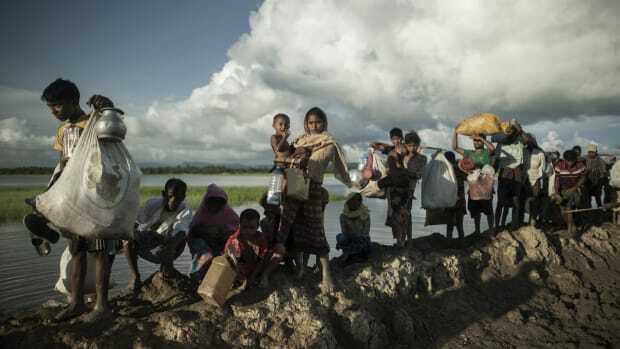 It is a crisis borne of chaos that has not only tipped a delicate balance on Bangladesh&apos;s water-scarce and cyclone prone southeastern tip but also accentuates the humanitarian challenges for both refugees and an overwhelmed local population. "It was like a jungle, all of this. 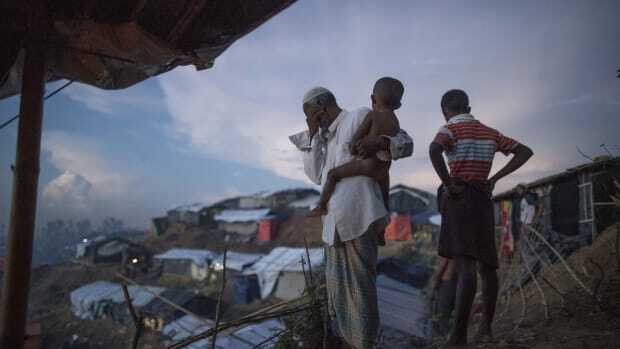 There were trees and fruit plantations," said Rehana Begum, a local Bangladeshi whose home now lies in the middle of the mega-camp. "Now there are so many homes here but they only appeared over the last two or three months." Those homes are simply tarpaulin sheets fastened to bamboo poles and pinned into patches of earth the refugees hacked from the hills. From inside the Kutupalong-Balukhali camp, the lines of those tents and hills they cling to are impossible to see past—a sea of dust and plastic that repeats into the horizon, scarcely a tree in sight. Satellite imagery provides a startling overview of those 1.5 square miles: From August of 2017 onward, Kutupalong’s brown mass creeps steadily outward, eating farther into the government Teknaf Game Reserve that surrounds it until it joins with the smaller Balukhali camp to the south. A group of Rohingya men take a break on the long route home from collecting firewood from Bangladeshi forests. "From the late seventies, whenever the Rohingya people came to Bangladesh, they settled down in Teknaf and Ukhia areas and basically in forest land, as there is no [other] available space in those areas," said Ali Kabir, the Bangladeshi forestry department&apos;s officer for Cox&apos;s Bazaar South, the district the Kutupalong-Balukhali camp falls under. While the Muslim minority from Myanmar&apos;s western Rakhine state have previously fled to Bangladesh in the tens of thousands after operations by the Burmese military in 1978, 1991, and with increasing frequency over the past 10 years, the most recent influx, and corresponding changes, have been far more intense. "They are cutting down the hills, they&apos;re chopping all the trees, herbs, shrubs, then erecting their shelters. As a result, the topography of that area has been greatly damaged," Kabir said. 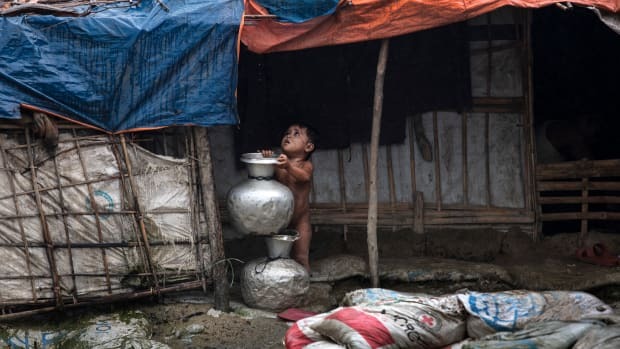 It is from the west that every day, all day, a constant stream of Rohingya men, as well as some women and children, are found wading through puddles, bowed under the loads of firewood each has to go hunting for several times a week. Eight hundred tons of fuel wood are now needed daily, according to the United Nations&apos; Food and Agriculture Organization. The sheer weight of that demand created by the refugees in just the Kutupalong-Balukhali camp&apos;s surroundings—and more spread through other camps—has forced the forests to rapidly recede. That doesn&apos;t include the thousands of babies who will be born in coming months. The camp&apos;s overwhelming brownness does gradually give way to more greenery on foot-beaten paths that lead away from it, but mile upon mile of vestigial tree stumps and scythed-down shrubbery offer no more than a hint of how far the forest has retreated. What had been a six-mile round trip when the newest Rohingya refugees first arrived has doubled into 12 miles with entire days spent walking and cutting trees. A young Rohingya boy hacks at roots on a hill inside the Kutupalong-Balukhali refugee camp to gather what remains for use as fuel. The route winds on and on, offering no shade from the Bangladeshi dry season&apos;s unfiltered sun. Everywhere there is either someone carrying loads or sat down by the side on one of the numerous breaks they have to take. Barefoot, both men and women wrap themselves in simple pieces of cloth, known as lungis, paired with a vest or blouse and no protection from the elements. Few carry water and some even drink from muddied puddles created a few days earlier by unexpected rains. "I don&apos;t know how to count the miles I&apos;m walking but I start very early in the morning and get to the forest by about 10 o&apos;clock," said Ayub Ali, who fled Maungdaw township in Myanmar in September. He spends an hour hacking away at the trees with his machete, the universal tool of Rohingya and Bangladeshi villagers, before ambling his way home, resting regularly by leaning against a stack of branches taller than himself. 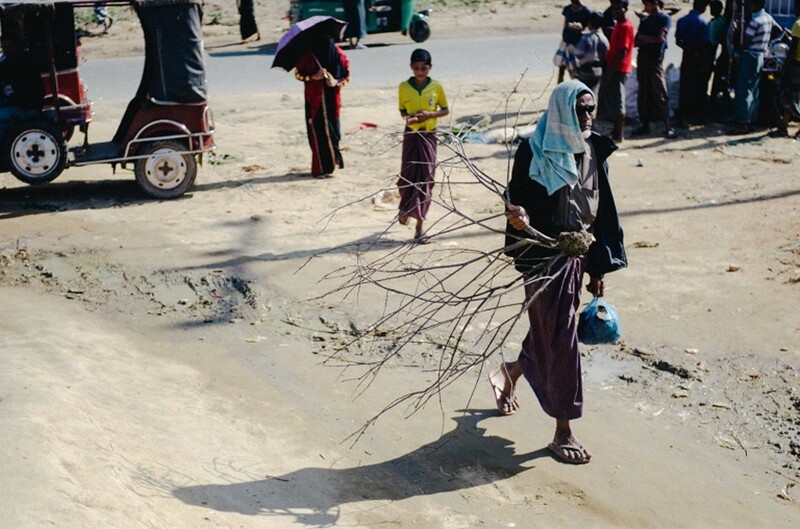 Many out collecting firewood are children, some with adults but others sent along with siblings and friends by parents who also have to make sure they are in the camps to collect their aid supplies–which usually offer no alternative fuel for cooking on. Not everyone is able to walk the whole way, especially some of the youngest children. Instead, they can be found along the route, or even in the camp itself, hacking at the ground to free left behind tree stumps or pulling at wiry roots—a task almost as tedious as the longer journey because of how little fuel they can scavenge. "When they’re cooking green fuel, they’re going to get sicker a lot faster; eye infections, respiratory infections," said an environmental consultant involved in the emergency response, who could not be named as he was not cleared to speak to media. "It’s just really unhealthy to be cooking green wood and its worse for the forest too because if you’re cooking green wood, it means you&apos;re cooking on the last of it." 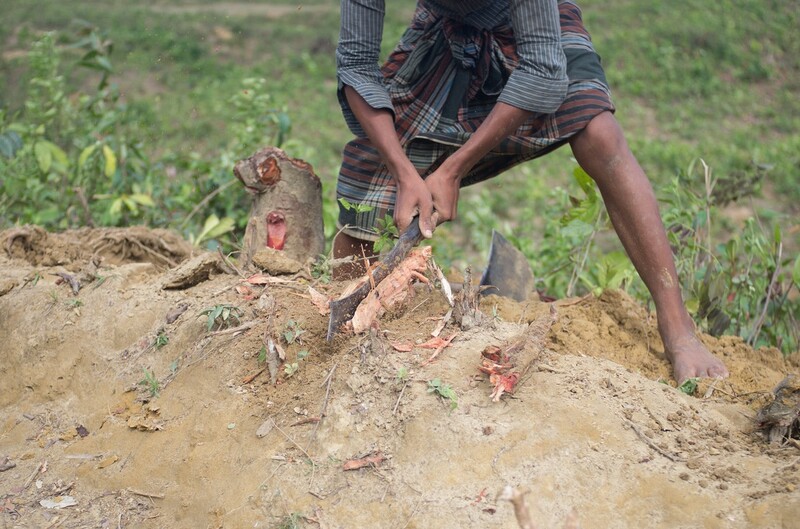 A Rohingya boy chopping wood from tree stump he freed from soil near Kutupalong-Balukhali refugee camp on Bangladesh. 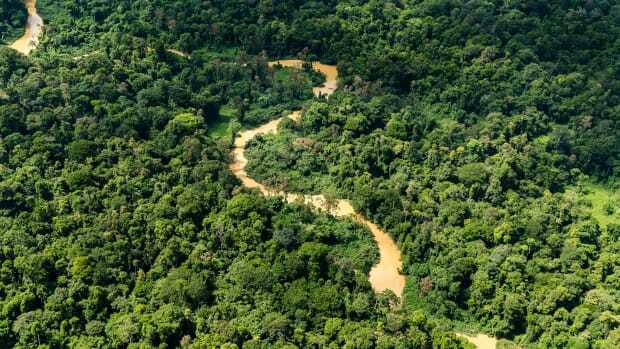 The majority of deforested land has been government-owned, according to forestry official Kabir. Almost half of that land was part of the 15-year-old government Social Forestry Program–now decimated. The program relied on public land and quick-growing trees that could, within a decade, provide local communities a sustainable income through selling the highly valued timber used for furniture. "About 2,000 acres of social forestry has been completely destroyed ... almost 1,000 poor people are involved in this program," Kabir said, noting that local Bangladeshis have handed in a petition requesting the government compensate them for the lost land. "It is continuing, so the area of destruction is increasing day-by-day." In contrast to previous influxes of Rohingya refugees, many local Bangladeshis have tolerated the Rohingya—if not willingly, at least after prompts by Bangladeshi Prime Minister Sheikh Hasina—but also grumble about how long they will stay. He said it was local Bangladeshis who were bringing the wood in from somewhere north of Kutupalong, though he did not know exactly where. Without the government monitoring it, it is hard to know exactly how much the trade in wood is also affecting the forestry even beyond the camps&apos; immediate surroundings. 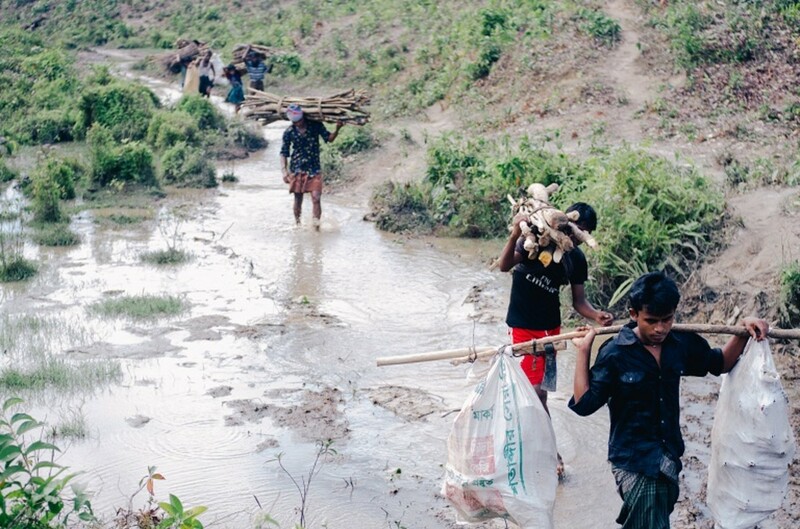 Rohingya men wade through water after heavy rains while returning from collecting firewood. The Cox&apos;s Bazaar and Teknaf districts that run along Bangladesh&apos;s border with Myanmar have long had problems with water. Usable groundwater supplies in some parts are much deeper than usual, which makes getting to them hard and limits how much can be used in an area that already had around 300,000 Rohingya refugees living in it, mostly from influxes since 1991. That problem, according to a 2012 study by the University of Dhaka, is caused by a high amount of rainwater running off into the nearby River Naf and Bay of Bengal—a problem expected to be exacerbated by mass deforestation reducing the amount of vegetation to pull water into the underground aquifers. The International Union for Conservation of Nature also highlighted the region as one of 10 in Bangladesh that are severely vulnerable to saline water from the sea contaminating sweet-water sources locals may otherwise have been able to draw from. "The more water that goes, the less that gets recharged into the aquifers because that water runs right out to the sea. It doesn&apos;t trickle down like it&apos;s supposed to," said the environmental consultant who asked to have his name withheld. Leaking latrines, open defecation, and tube wells placed too close to latrines have polluted the groundwater, leading to more than 60 percent used by the refugees being contaminated, the World Health Organization warned. More realistically, plans are being made to harness existing nurseries and nurture more in order to start reforestation around the camps. Part of that will include eco-terracing—quickly plugging some greenery back into the stripped-down hills to provide some protection against landslides when monsoon rains, and potentially cyclones, hit in the coming months. A Rohingya man walks through the Kutupalong-Balukhali refugee camp with some roots he pulled out of nearby land to use as fuel. They are also hoping to limit how many Rohingya are turning to the forests for firewood by improving the stoves they use and offering alternative fuels like gas or briquettes based on harvested rice husks or coconuts—though some of these options are limited by season. "It should be a sector in itself, it never gets looked at quick enough—that&apos;s the argument," he said. "This is difficult, it&apos;s draining to do this every day," he said. "But we need to eat and there&apos;s nothing else to cook on."